Erring on the Side of Love: Who me? Yes, you! My sweet Junebug! My Lil P! My active and playful son! My joy-filled little one! You are turning one in just a few short days!!! I realize we have yet to see an 11 month update, much less any posts about anything since about a month ago. Maybe it's because I'm in denial that my first-born is turning one? Maybe it's because I really have been too busy (which we have been pretty active lately). Maybe it's because I have so many thoughts I'd like to post on but can't organize my thoughts just enough to write something? Or, maybe all of the above. 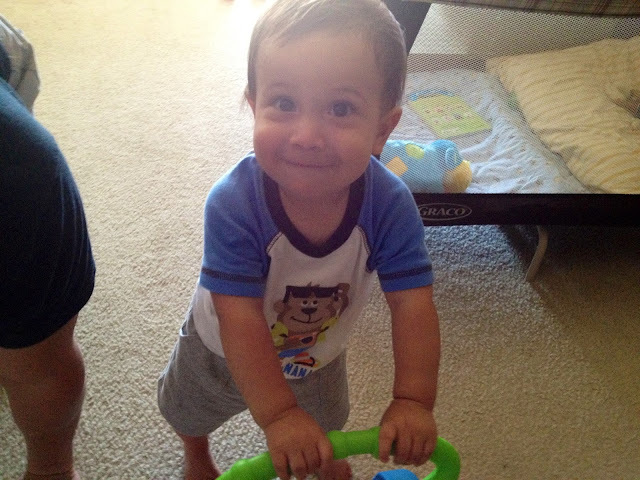 Regardless, here's my Bigfoot, just days before he turns one. My hope is to post about his year and get our monthly updates caught up; meanwhile, relish in every precious moment I have with my beautiful boy!